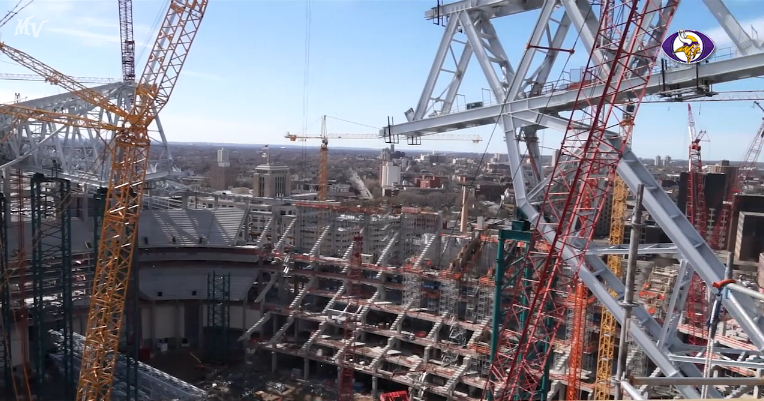 The new Minnesota Stadium construction continues toward its goal of a July 2016 opening and the team announced last week it had reached 50% completion in the 16 months since its groundbreaking. Meanwhile, the team and stadium authority have had other news to report. Over 900 workers are on site pouring concrete (about 80% done) and completing the frame of the stadium. The highest point of the ring beam around the roof line was recently poured, 269 feet above the ground. Two pieces remain to connect the large center beam of the stadium’s roof. At the same time, crews started installing glass, made by Owatonna’s own Viracon, in the stadium. “When sheets arrive from a supplier, the external side is treated with a “high-performance coating” on the exterior side that will allow light to transmit while limiting solar heat from passing through,” a team release said. As for paying for all of this construction, the team contributed nearly $20 million more toward the project, including “food service equipment, event level space build-outs… retractable seating upgrades [and]a Club Purple deck that overlooks downtown Minneapolis. Some of the money will also be for plaza enhancements, the same plaza that fans can now purchase and place customized pavers in with their names. The approximately 12,000 bricks go for $160-$360. In all, the stadium construction is well on pace and moving swiftly for the 2018 Super Bowl hosts. Soon enough we will also be talking about a new soccer stadium, as well.